Indonesia’s tight presidential race could diminish the country’s chances of finding decisive leadership to execute urgent reforms. The July 9 election is likely to be a close call. Popular Jakarta Governor Joko “Jokowi” Widodo has seen his lead over ex-general Prabowo Subianto disappear since mid-May. That’s when Golkar, the archipelago’s second-most popular political party, decided to back Prabowo. The Jakarta stock market, which had risen by 19 percent in the year to that point, has gone sideways since. The immediate worry for investors is the prospect of a Prabowo win. His political agenda evokes nostalgia for Indonesia’s authoritarian past, and his talk of economic self-sufficiency smacks of protectionism. But a narrow victory for Jokowi – who has a reputation as a clean, efficient administrator – would also be a disappointment. That’s because of the way “old guard” politicians have coalesced around Prabowo, who has put together an alliance that would control almost two-thirds of parliament. In a political culture that stresses decision-making by consensus, and where economic bills can take 600 days to become law, the scope for decisive presidential action is already limited. A big victory for Jokowi might lure Golkar and current President Susilo Bambang Yudhoyono’s Democratic Party to his side. Otherwise, adversarial lawmakers will be able to tie him down. That would be a pity. The boom Indonesia has enjoyed thanks to surging demand for Chinese commodities has faded. To sustain a 7 percent yearly expansion in GDP, growth in annual labour productivity will have to jump by 60 percent, according to McKinsey. That can’t come about without reforms in education, labour laws and the elimination of energy subsidies. Indonesia has a chance to embark on those reforms because its population is still young and growing. And yet the leadership contest suffered from petty distractions: A smear campaign against Jokowi sent him scurrying to Mecca to prove his Islamic credentials. Meanwhile, Prabowo’s party is parading fiscal recklessness as a growth strategy, promising to double public debt to 50 percent of GDP. Unless Jokowi can muster a big win he may not have much luck with serious reforms. Even a narrow victory could still see the economy losing out. Combination image shows Indonesian presidential candidate Prabowo Subianto in Jakarta on May 20, 2014 (L) and Jakarta governor and presidential candidate Joko "Jokowi" Widodo at a PDIP party campaign in Jakarta on March 16, 2014. About 190 million Indonesians are eligible to vote for the country’s next President on July 9. 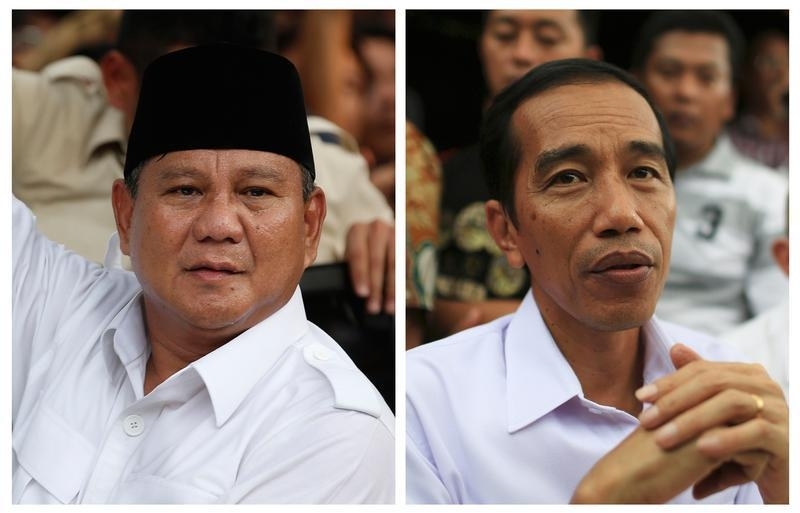 The two candidates are the popular Jakarta governor Joko “Jokowi” Widodo and ex-general Prabowo Subianto. An opinion poll conducted by Roy Morgan with more than 3,000 voters in June suggests the race may be too close to call, with Jokowi leading Prabowo by 4 percentage points. The Indonesian rupiah has weakened 2 percent against the U.S. dollar since May 19, when Golkar, the country’s second-most popular political party, decided to back Prabowo. The Jakarta Composite Index rose 0.7 percent to 5,024.71 on July 8. The benchmark, up 19 percent so far this year, has been almost unchanged since May 19.